Being born and raised in Texas, I love introducing a “touch of Texas” into my table settings throughout the year. Christmas is certainly no exception! Living in Colorado now, adding a “rustic” flair is a natural fit, not to mention featuring a winter theme. Growing up, I never had a real white Christmas until we moved here to Denver. It truly has been blessing for our kiddos and our guests that have visited! 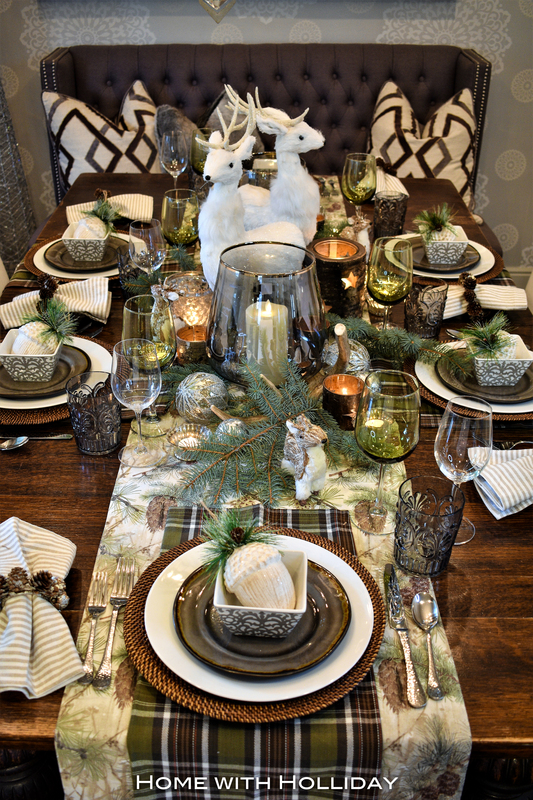 All of these factors inspired this Rustic Winter Christmas Table Setting. Considering “Tis the Season”, we are hosting a dinner party right after Thanksgiving. So, I decide to put the table together a bit early and share it with you! The best part of wrapping it up now is that we get to enjoy it for a while! Bob Hope said years ago, “My idea of Christmas, whether old-fashioned or modern is very simple: loving others”. I would add to that quote with “…loving others…around a beautiful table with a meal served from the heart”. Having a breakfast room that is both modern but with a touch of old-fashioned provides a great backdrop for this rustic, winter theme. The natural antique patina of my great-grandmother’s table certainly adds such warmth to the setting. This is precisely why there is no table cloth or even placemats used in the design. Let the natural texture of your table shine through! My great-grandmother was gifted this table in 1900, so there has been a lot of love sitting around this table! Having already purchased the spruce, pine cone themed table runner last year, it was a great place to start. In a recent Fall and Thanksgiving Table Setting post, I created a place setting that could certainly be used again. Reusing the same layer of plates for this new setting made things super simple. Click the image below to see it in the original post. An essential part of entertaining cost effectively is recycling and re-purposing your existing serving ware . Always consider how you can reuse anything you buy for your table! A favorite find from the table setting above that is being reused for this new design is the salad plates…from Walmart…for only $4.38 per plate!!! 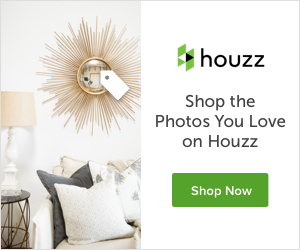 Click here to see or order. In the constant quest to find affordable, dramatic table accessories, these “hand crafted” plates really hit the jackpot! With their green and brown tones, they absolutely have a rustic feel and are perfect. The colors also coordinated brilliantly. The pine cone napkin rings are another item that are being re-purposed. They were in the clearance section at Pier One. Never, ever pass on checking out the clearance section! When building a table setting or centerpiece, it is important to consider including several elements. These include natural or organic items, a variety of textures, a similar palate of colors, glass, candles and always a bit of sparkle! It is also a good idea to incorporate a few items that contribute to the “theme” of your table. In this instance, the white deer (purchased from, yes, BIG LOTS for only $17.60 each!) and the rustic candle holders ($4 each!) did the trick. They both tie in the “winter white” aspect and the woodsy, rustic feel! Here, I chose this white deer to coordinate with my white chair covers. However, you could use any sort of animal or texture or even a Santa figure that works with your own color scheme. Click on these images below to purchase them for your own centerpiece. To add a variety of color and texture, you can do so by using a creative blend of glassware. Another great discovery when shopping for this season was finding the Green Wine Glasses from the Dollar Tree for $1! In one my recent posts, Dollar Tree Fall/Thanksgiving Table Setting, you will see a fall table setting using only items purchased at the Dollar Tree. These these gorgeous olive green wine glasses were used for that design project. I knew there would be multiple applications for them and voila! The adorable grey tumblers are from Cost Plus and add such a great touch. For the natural, organic element for table, I simply walked outside and trimmed off the greenery from one of our blue spruce trees in the back yard. If you live in an area with no spruce trees, feel free to use faux greenery of some kind. Flowers would be nice here too, but I went for “free” greenery (insert smiley face!). To wrap things up, layer in the candle and votive colors from large to small. Next, add in mercury glass and sequined ornament balls for the sparkle…that is always a must! Be creative and use ornaments you already have. When guests take time out of their busy schedules, I think it is important to send them home with a little something special. For this holiday gathering, selecting a Christmas tree ornament (this one is from Hobby Lobby) for their party favor was perfect. Plus, it also adds the theme of the table setting…bonus!! Hopefully, our guests will think of our evening together when they see it on their tree! Thank you for stopping by to see the details of my Rustic Winter Christmas Table Setting! Please share your comments on this post! I am confident any dinner table you create will be amazing! Thank you for the comments, Heidi!